A piece of my mind. : Use the Lift, Luke! 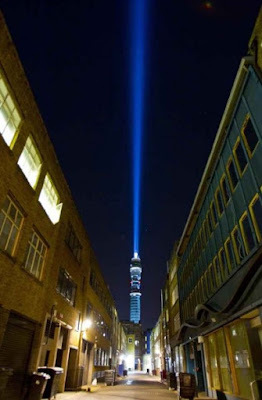 The grey skies of London light up last night (Thursday 15th September) courtesy of LucasFilm and the folks at Soho's BT Tower. In a PR stunt set to infuriate Lord Vadar, a high powered blue light shot 200M up into the air from the towers roof to mark the release of all six films digitally remastered for Blu-Ray. Using a total of 270,000 Watts, the light replicated the sabre well owing largely to the towers construction resembling that of the Sabre's handle.